Military members looking to become truck drivers may have an easier time in doing so as the Federal Motor Carrier Safety Administration (FMCSA) has authorized states to waive the commercial learner’s permit (CLP) knowledge test and driving skills tests. It does not direct the states to do so but allows each state to at its own discretion. Spc. Trey Dodds, a truck driver with the 110th Composite Truck Company, attaches a trailer to a vehicle as evening falls on Thursday, September 13. 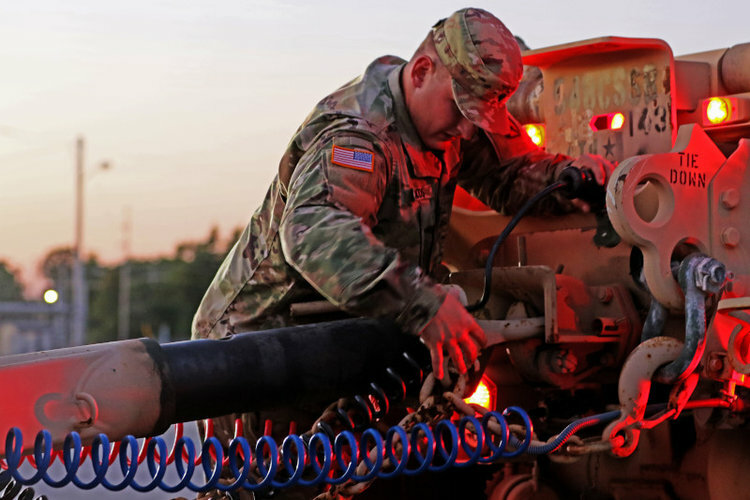 Soldiers worked into the night preparing vehicles for rapid deployment to hurricane-affected areas along the American East Coast. The rule also states that certain drivers can be exempted from taking the driving skills test as well. Many in trucking have viewed veterans as a key piece to help alleviate the driver shortage but concerns over the timeliness of that process and the inability of states to recognize veteran’s driving experience have slowed that process. One of the factors that delay licensing is that CDL holders must pass requirements in their home states – which for military members is often not the state in which they are stationed. The Military CDL I rule, issued in October 2016, sought to alleviate this by allowing states to extend up to 1 year the time a candidate has to apply for a test waiver after leaving the military. It also allowed the state where the military member is stationed to coordinate with the member’s home state on the knowledge or skills test. This rule, first published on June 17, 2017 as proposed rule, received 17 comments, FMCSA said, with 15 in support. Among those submitting supporting comments was American Trucking Associations (ATA), the Owner-Operator Independent Drivers Association (OOIDA), the International Foodservice Distributors Association (IFDA), the Propane Gas Association of New England (PGANE), the National Propane Gas Association (NPGA), and the Commercial Vehicle Training Association (CVTA). Many commenters felt the rule would reduce the burden to enter the industry, including the time it takes to become licensed, and help in recruiting efforts. Question 26: Do active duty military personnel, not wearing military uniforms, qualify for a waiver from the CDL requirements if the CMVs are rental trucks or leased buses from the General Services Administration?